You can listen to the stories of child refugees on the radio, or watch them on the news, but it’s an issue that seems distant for many. 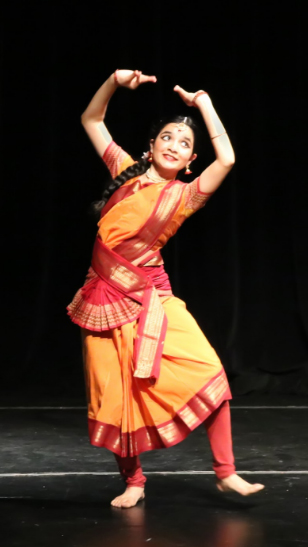 That’s why Middle Years Programme (MYP) student Shraddha Joshi used Bharatanatyam, a classical Indian dance style, to demonstrate that the global crisis is everyone’s responsibility. For her personal project, Shraddha, from Meridian World School, in Texas, US, originally wanted to create a video or small presentation depicting the refugee crisis through dance. However, six weeks of volunteering with GirlForward – which mentors high-school-aged refugee girls in Austin – changed the course of her project, and her life, she says. Shraddha realized that she “needed” to bring her project out to a bigger audience and raise awareness of the plight of refugees. Her project developed into a full-scale production, called Displaced, and was attended by 150 people. Based on true events, Displaced tells the stories of five different child refugees from around the world. It combines narration, Bharatanatyam dance and video clips. She had hoped to interview children from GirlForward but soon realized that it may have been too difficult for them to tell their stories. Instead, she used personal accounts from Save the Children and UNHCR – the UN Refugee Agency – to write her own realistic stories. Displaced raised just under USD$6,000 for GirlForward. The greatest thing I learnt from the project was the power of one voice,” adds Shraddha. “Before I embarked on this project, I always thought that ‘making a difference’ involved someone with a lot of power or money. What I didn’t know was the fact that this ability is in everyone’s hands. Displaced ended in January, but it’s just the beginning for Shraddha. She has been volunteering regularly as a Youth ESL (English as a second language) Tutor for young child refugees with the Interfaith Action of Central Texas (iACT). Shraddha also received a scholarship to study Arabic in Jordan over the summer. She wants to use her skills to further support this cause. “For my Creativity, Activity, Service (CAS) project, I am hoping to work with iACT and create a peer support programme, which would pair teenage refugees with local high schoolers,” she adds. Share your IB story with the world!